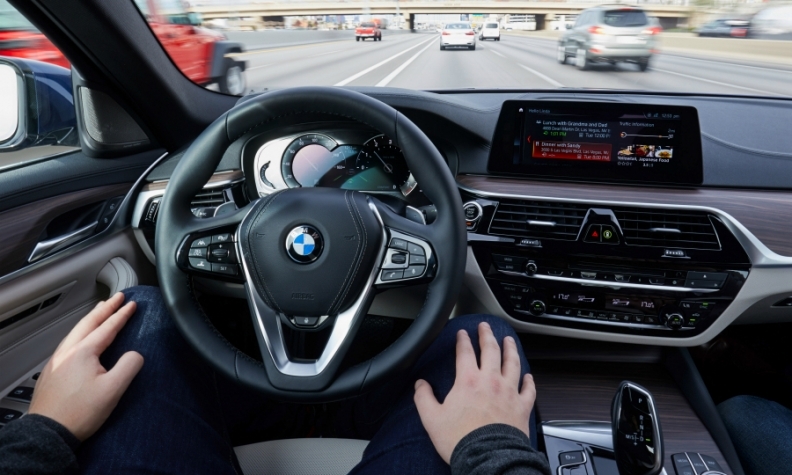 Many suppliers and automakers, such as BMW, are developing autonomous systems. DETROIT -- Self-driving cars are facing fewer hurdles in the UK, Germany, South Korea and Singapore, where governments have enacted legislation allowing public road testing, than in the U.S.
An absence of national legislation to clarify a "checkerboard of state rules" hampers the deployment of driverless cars in U.S. states, Bloomberg New Energy Finance (BNEF) said in a report. Those nations are outpacing the U.S., California and Arizona, which lead the 50 states in allowing tests of driverless cars and host the largest fleets, according to the report released Tuesday. Daimler, General Motors and Tesla join technology companies Alphabet and Baidu in spending billions of dollars and filing thousands of patent applications in the quest to build cars with varying degrees of autonomy. The ultimate achievement is Level 5 autonomy, in which a car doesn't need a steering wheel. Global governments want their own national champions in developing self-driving cars, but they hesitate to put them on public roads because the technologies are immature. While different cultural and political systems have contributed to the differences in legislation, Asian countries overall are very aggressive in allowing AVs on their roads, said Alejandro Zamorano, a San Francisco-based BNEF analyst who wrote the report. In Europe, the UK is leading in shaping a conducive environment for testing, with four cities allowing public trials. France and Israel allow tests on their public roads on a case-by-case basis. As a result, both countries aren't fulfilling their potential as hosts of large automakers and novel technology companies, according to BNEF. Germany may have created a framework for other countries. It allows testing with a driver's hands off the wheel, but the automaker is responsible for accidents if the system fails. Germany also has ethical principles in place that require car-driving software to prioritize human lives over animals and property. South Korea is "the silent leader," with plans to have AVs for sale by 2020, according to BNEF. The nation allows testing on 320 kilometers (200 miles) of public roads and is supporting construction of a test circuit in Hwaseong, south of Seoul, set to open this year. More than 40 cars are being tested on public roads by Hyundai, Samsung Group, Volkswagen Group and Seoul National University, among others. "Initially, our impression is they are being relatively laggards, but in reality, they are actually doing a lot," Zamorano said of Korean regulators. Singapore is also swiftly executing strategy to help ease its congestion problems. Tests on public roads started in 2015, and the city-state is moving ahead with plans to deploy driverless buses. Port operator PSA Singapore may launch a tender for driverless vehicles at the Tuas mega port, according to a February report. Yet the nation poised to overtake them all is China, which in April issued draft guidelines on road testing AVs and is reviewing a final version. The technology behind self-driving cars is considered critical to the government's plan to elevate the nation's standing in the global auto industry. China wants to deploy 30 million vehicles with some degree of autonomy within the next decade, fueling a domestic semiconductor industry and encouraging Baidu to create a self-driving platform called Apollo. The search-engine giant announced the $1.5 billion Apollo Fund to invest in 100 autonomous-driving projects over three years. TuSimple, a Beijing-based startup developing self-driving trucks, plans to start commercial operations in Shanghai and Arizona. China said last year it wants half of all new vehicles to be equipped with some automation by 2020. The nation is putting "everything in place to lead on AVs," the report said. China proposes that provincial authorities manage tests, an approach federalist North American countries could benefit from, BNEF said. Seventeen U.S. states and only two Canadian provinces -- Ontario and Quebec -- allow road tests. "The U.S. and Canada have basically separated jurisdictions between the federal government and the states or provinces," Zamorano said. "It's actually harmful to test autonomous vehicles because there's no clarity on who's allowed to do what." To be sure, California is home to 52 autonomous car-testing programs, making it the largest open test ground in the world. The state adopted regulations for testing on public roads in September 2014, and an amendment in February allowed trying out the vehicles without a safety driver on board. BNEF expects the passage of the U.S. Autonomous Vehicle Start Act, currently in the U.S. Senate, to ignite a string of tests across state lines. Eighteen states currently don't have any laws covering AVs. Yet lawmakers still are debating key components of the federal bill. It could force arbitration in the case of an accident, meaning the victim of a crash couldn't participate in a class-action lawsuit against the technology's maker. Consumer advocates are pushing against that provision, the report said. As currently written, the act also wouldn't change safety standards for the vehicles. In the wake of two recent fatal crashes involving self-driving technology developed by Uber and Tesla's driver-assistance system Autopilot, safety advocates want to make sure other motorists are protected. The lack of federal leadership forces automakers to navigate a patchwork of regulations that range from the strict -- like New York's requirement that state troopers trail self-driving test cars -- to those in Florida and Arizona that allow cars without drivers on public roads.